I frequently hear things like “I really hate snakes!” or “I’m not going hiking because there are snakes out!” Well, I’m here to tell you that it is entirely possible to continue hiking during the months when rattlesnakes are not hibernating. With a little know-how, you won’t have to give up your summer hikes (hot as they might be!) Much like humans, rattlesnakes are just trying to survive. In fact, rattlesnakes play a vital part in the desert ecosystem. 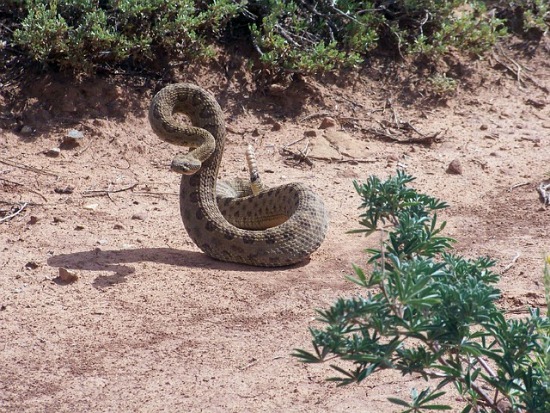 Rattlesnakes don’t want to run into you any more than you want to meet up with them. In fact, you’ll be happy to know that according to the U.S. Department of Fish and Wildlife, your chances of dying of a venomous snake bite is nearly zero (1 in 50 million will die) [source]. This is because of highly available quality medical care. So please do NOT let fear of rattlers stop you from enjoying your trails! Unfortunately, rattlesnakes come in a variety of patterns and colors. So I can’t tell you that any brown snake with diamonds on its back is a rattler. But they do have a few defining characteristics. Rattlesnakes are pit vipers. This means that they have visible pits on their head that can detect the heat of their prey. Their eyes have vertical pupils which allow them to see in very low light. One of the most distinctive features of a rattlesnake is the triangular shaped head. These snakes also have very thin necks, but fat bodies. They can range in size from 10 inches (newborns) to 8 feet long. Rattlers are cold-blooded and need to seek out warmth when they get too cold. This is why you’ll often find them sunning themselves on a road or a large rock. Each time a rattler sheds its skin it gets a new rattle segment. However, the rattles may break off or be damaged so some adults snakes will have no rattle. It is rare to find a rattlesnake with more than 8 – 10 rattles. Rattlesnakes also have a hinged jaw which means their jaw can open 180 degrees wide. Since they do not chew their food, but swallow it whole – this type of jaw is necessary. Rattlesnake fangs are like curved dual hypodermic needles (hollow). Venom can be injected into their prey via one or both (or neither!) fang. A “dry bite” is thought to be a very common occurrence when rattlers strike to defend themselves (rather than when hunting). However, if you are bitten – ALWAYS assume it was not a dry bite. Rattlers live for approximately 20 years, although this number may be much less due to predators, disease, or other factors. 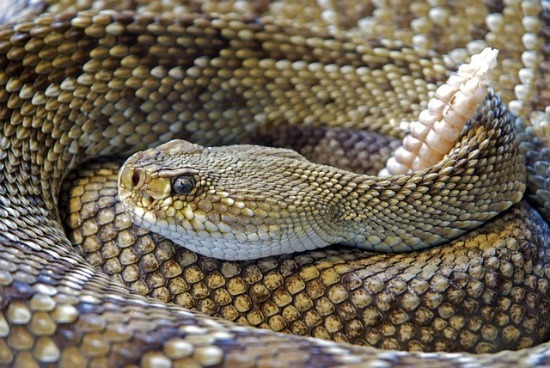 Rattlesnakes give birth to live young, but do not stay to parent them. The baby rattlesnakes usually stick around where they were born for 7-10 days and shed their first skin (including getting their first rattle) and then move along to find food. A mother snake will most often produce 8-10 babies. Rattlesnakes are carnivores and their prey is dictated by how large they are. Most prefer mice, bunnies, lizards, and other small animals. Their food is slowly digested over a span of a few days. During this time, the snake will be very sluggish. Rattlesnakes do not move in pairs. They usually are found in pairs during mating only (spring and summer). They are considered an adult at around 3 years, but females tend to have babies only once every 2-3 years. How can I tell if a snake is a rattlesnake? The most notable characteristic of a rattlesnake is the rattle on the end of its tail. The triangular shaped head is also very distinctive. 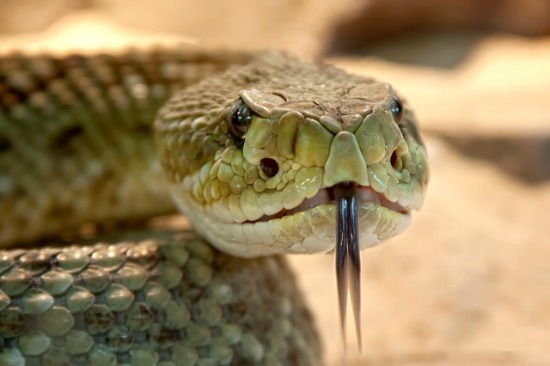 If you aren’t sure if a snake is a rattlesnake or other venomous snake – do not approach it. Keep your distance and find an alternate path. Or wait at a safe distance until the snake has moved along. When can I expect to see rattlesnakes? Rattlesnakes hibernate each year in the Southwest. They usually come out of hibernation sometime in April or May and usually return to hibernation in September or October (although sometimes as late as December). They tend to be most active when temperatures are between 80-90 degrees Fahrenheit. This means that in the spring and fall they will be active through much of the day. However, when summer comes (with its much higher temperatures) rattlesnakes will be seen far less often. 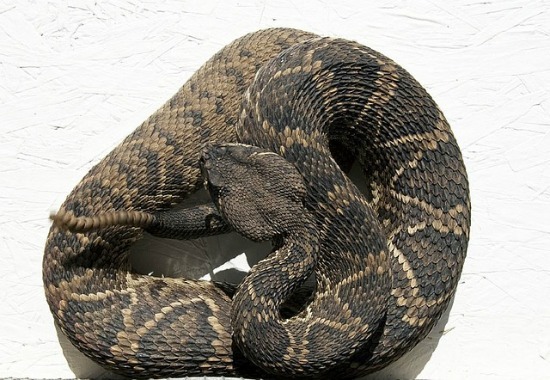 In fact, rattlesnakes cannot tolerate temperatures above 95 degrees Fahrenheit for very long. Extreme temperatures can be fatal for them within 10 minutes so they are rarely found outside during the summer when temperatures consistently stay in the 100’s all day and all night. These snakes tend to find a den to shelter in (and tend to return to the same den over time) in order to avoid the worst of the summer heat. Here are some easy things to do while you’re hiking in rattlesnake country to avoid a bite. Be aware of your surroundings. Hissing and rattling are simply the snake warning you of their presence. If you avoid them, no one gets hurt. Wear thick ankle-high boots and long, loose fitting pants. Rather than stepping over rocks – step onto rocks. That way you have an opportunity to look at where you are stepping. 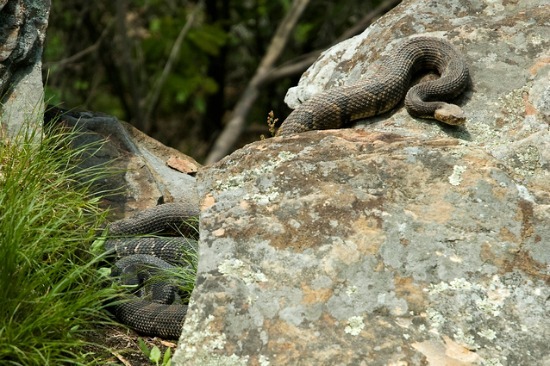 Snakes like to hide at the base of rocks in order to catch prey. It’s very easy for you to accidentally stumble onto a rattler patiently waiting to catch their next meal. Don’t put your hands into places you can’t see. Use trekking poles to push back brush while hiking through dense vegetation. A trekking pole can also be held in front of you if a rattler is striking to redirect the snake. Better a trekking pole than you gets bitten! DO NOT attempt to get closer to pick up, kill, photograph, move the snake from the trail, or otherwise disturb the snake. Most bites happen to people who approach rather than back away. Choose trails that are busier or more popular. The more people, the less snakes you’ll find. Also, choose trails that are not overgrown and have a wide clear walkway. Keep your kids and dogs close (dogs should be leashed). Don’t hike alone. I recommend this with all hiking, but in this instance if one person is bitten, the other person can seek help. The most important thing you can do if you are bitten is to SEEK MEDICAL ATTENTION. A rattlesnake bite is ALWAYS a reason to call 911. Try to keep the bite site lower than the heart of the bite victim. And here’s the really hard part, you want to keep the person who was just bitten by a rattlesnake calm. Pretty tough challenge right? But the faster your heart pumps, the faster the venom spreads. So a calm person is the best way to keep that venom localized. Keep them calm and still if possible. Remove all tight fitting clothing and jewelry around the bite site since the site will swell significantly. Better to take off those rings now than have to cut them off or risk losing a finger later. Let the wound bleed for 15-30 seconds and then cleanse it carefully and wrap loosely with gauze (or other clean cloth). Create a loose splint to further restrict the movement of the wound area. Check vital signs of the bite victim. Are they going into shock? You may need to keep reassuring them over and over again that things will be all right. Lastly, try and identify the snake if possible. I don’t mean you should grab the snake and risk getting bitten yourself. Simply take a look if possible, keeping a safe distance. If you’re too far away or the snake is gone – that’s okay. Let’s say you happen to be the person who was bitten and you’re all alone – call for help on your cell if you have reception. If not, walk slowly taking frequent breaks until you do have reception. Now here’s where it gets tricky…what if you’re all alone on a four day hike out in the desert? You should still do exactly what I just said – walk slowly, take frequent breaks, and try to get to a spot where you can call for help. Believe it or not – this exact situation has happened before with a happy ending. Don’t panic and start moving around frantically. Keeping your heart rate low is very important. Panicking and moving around are surefire ways to raise your heart rate. Applying a tourniquet doesn’t keep the venom from spreading. In fact, allowing it to spread helps to dilute it and reduce the tissue damage that might occur if it was concentrated in one area. Don’t apply a cold pack. Cold restricts blood flow to healthy tissue and in this case, we want blood flowing freely. Don’t let the person who was bitten eat or drink anything. Empty stomachs are always better for medical professionals. Don’t attempt to suction the bite site (with a device or your mouth). The suctioning thing actually causes damage at the bite site and removes hardly any venom. Just don’t do it. It was once the standard for snake bites, but it is no longer recommended. Don’t cut the wound any further. Snake fangs are curved so the venom might not be where you think it was injected. Or the bite might have been dry so cutting across tissue really only increases the chances of infection. Now, hopefully I haven’t freaked you out too much. The point here is that a little common sense helps you to avoid bites, and even if a bite does occur – chances are very good that you’ll come out of it just fine. A little information goes a long way towards helping us avoid rattlesnakes and enjoy our beautiful deserts. Previous post: Where is Big Bend National Park?